It doesn’t seem like Brooklyn, initially. Clay tiled floors, arched brick doorways, vintage Mexican newspapers and a mosaic mural of corn being ground by hand seem decidedly more south of the border than south of McCarren. 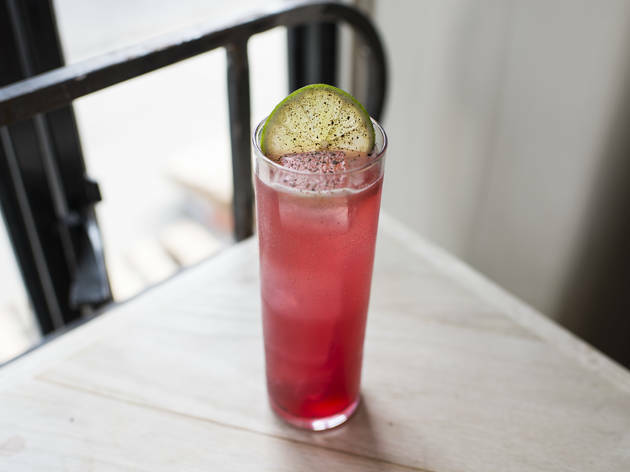 Couple that with service that’s as sunny as the warmly toned woods that dominate the corner space, and you’ll think you drank one too many Tecates and woke up near the Gulf of Mexico. 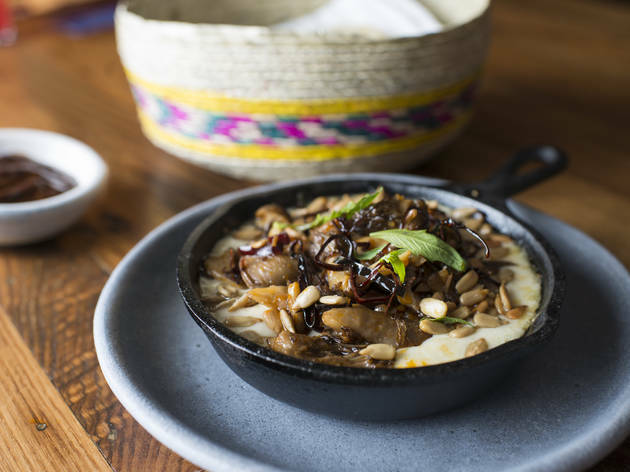 The folksy Mexico City ambience of Casa Pública is the effort of a native, Daniel Ortiz de Montellano, as well as Altamarea Group alum Bob Truitt and beverage director Meaghan Montagano (Extra Fancy, La Sirena). But the team can’t entirely shake the north Brooklyn vibes of the place. 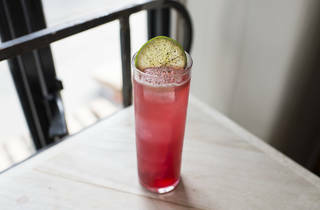 Silver-haired women sharing a $48 large-format tequila cocktail named after a Dirty Dancing quote don’t exactly champion Mexican authenticity. Chef Truitt’s regional, homestyle menu is more faithful to the restaurant’s inspiration. 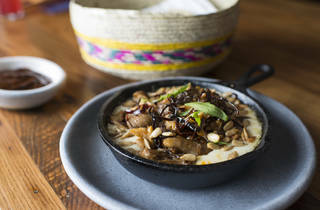 Crocks of queso fundido come laced with roasted green chilies and corn ($13), mushrooms and sunflower seeds ($14) or zesty red chorizo and salsa verde ($13)and are served with a basket of heirloom-corn tortillas with which to mop up gooey pulls of cheese. Those masa wraps are utilized in a range of two-to-an-order tacos, some of which—saucy mole chicken with salty queso fresco and toasted sesame seeds ($12)— are more successful than others. For example, a load of ricotta cheese and a dip in the fryer bogs down the delicacy of squash blossoms and Swiss chard ($13). A trompo in the kitchen promised al pastor, but spit-roasted pork was sadly nowhere to be found on recent menus; you’ll have to settle for carnitas instead, solidly built with juicy nuggets of pork confit, smooth avocado slices and crunchy chicharrón crumbles ($10). 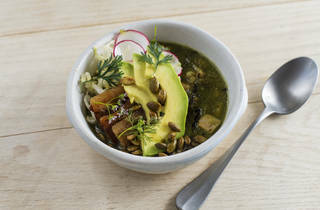 Larger plates include a few soups (pozole verde, sopa de elote) and meat dishes, including a nicely grilled carne asada dressed with a rustic, charcoal-tinged salsa and market finds like spring onion and fresh radish ($26). 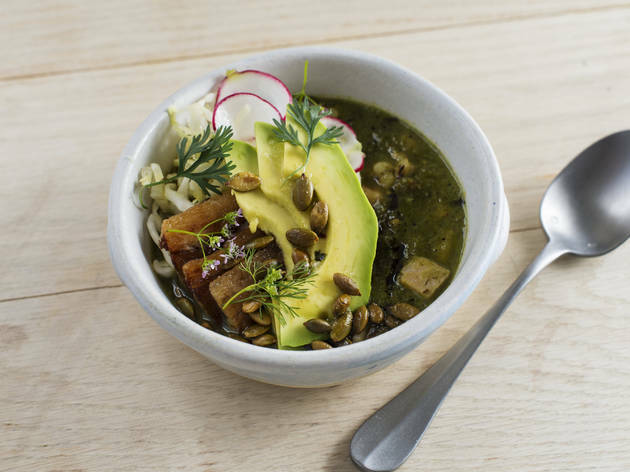 The food is certainly comforting, but in a golden age of modern, ambitious Mexican cooking (Enrique Olvera’s Cosme and Atla, Alex Stupak’s Empellón empire), Casa Pública seems a touch too low-stakes to move the needle.